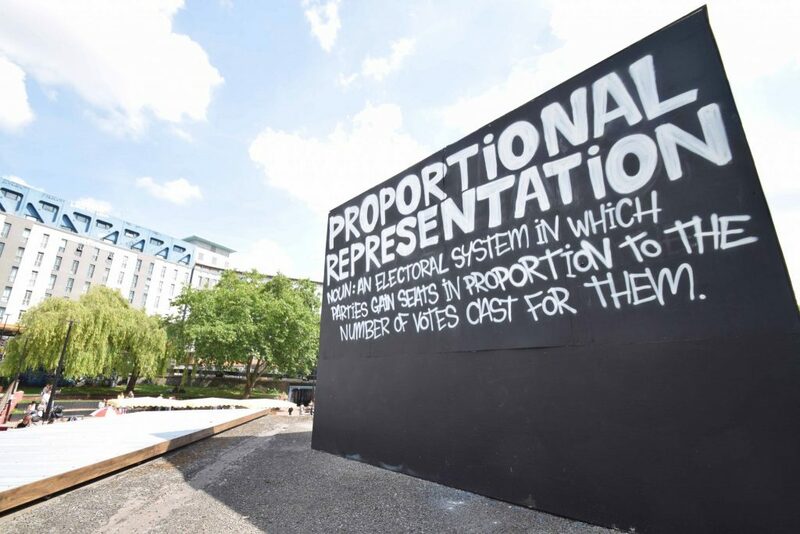 On the Outdoor Gallery and the Bearpit Cube, this time it’s all about voting, democracy and electoral reform. For the June election, after a dreadful Tory campaign, our Outdoor Gallery was adorned with the political opposition colours. Our friends from Hamilton House across the street put up a sister memo. Can’t say we’re not surrounded by good folks here in Stokes Croft. But not only the car-crash direction of the Tories needs to be addressed. Our current electoral system is fraught with inconsistencies and problems. Seats in Parliament don’t match how we vote, because it doesn’t take into account the overall number of votes. In 2015 the Scottish SNP won just under half of the votes, but got 95% of the seats. For the 2017 election, this is particularly striking when you look at the votes compared to the seats from the DUP and the Green Party (image source: BBC). With a total of 292,316 votes, the DUP gained 10 seats in Parliament, and got invited to govern alongside the Conservatives. Compare that to the Green Party, who gained a total of 525,435 votes and has one single seat in Parliament. This is so far off what people vote for and the reason is firmly rooted in the current ‘first past the post’ system, which allows a small party like the DUP to rise to power. This voting system means that we get governments we didn’t vote for. Our voting system urgently needs to be addressed if we want to call this democracy. Because everyone deserves to be heard, and this issue needs awareness. Check out the Electoral Reform Society for information, petitions and campaigns. Meanwhile our Cube on the Bearpit (photos below) raises these issues for passers-by. Go and have a look, and enjoy the sun!